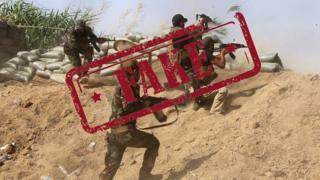 A fake battle, invented in a hail of tweets by a London man, has tricked both so-called Islamic State's supporters, and their opponents, supporters of Shia militia fighters in Iraq. It was supposedly an intense battle involving Islamic State and Shia and Iraqi government fighters. Soon after the news broke, Twitter users that back anti-IS forces claimed a famous victory. "Big celebrations in Karbala after the freedom of Shichwa," said one. Another claimed "10,000 refugees flee Shichwa to Karbala" and rumours spread that neighbouring countries were being dragged into the fighting: "Disaster: the Saudi Army must quickly mobilize to the Iraqi border." But the battle of Shichwa never actually happened - in fact, Shichwa isn't even a real place. The fiction was the work of Ahmad al-Mahmoud, an Iraqi who lives in London and runs a Twitter account called @IraqSurveys. The account usually collates serious news about what's happening in the country, and has nearly 14,000 followers. But one day, he says, he "got bored", and he tweeted that Islamic State had withdrawn from Shichwa. He even shared Photoshopped pictures of news outlets which appeared to show the battle being discussed. Soon chatter started to spread outside Iraq. Supporters of Popular Mobilisation Units - the anti-IS Shia militias fighting alongside Iraqi government forces - started boasting about the battle. Then IS supporters planned revenge, and people in Saudi Arabia started to get frightened about the rumours. However, realising that the joke was getting out of hand, Mahmoud called a halt to the prank after two days. BBC Trending interviewed Mahmoud and put it to him that his stunt was in fact dangerous - and potentially stoked and exploited real people's fears. His response: he remained adamant that it wasn't irresponsible to make up a battle on his mostly reality-based news account. The name of the place Shichwa is actually a joke - it's Iraqi Arabic for "cheese bladder," a traditional method of making dairy products. Mahmoud says that alone would have tipped people off: "It wasn't something serious. Any Iraqi should have known what a shichwa is." Mahmoud takes issue with all sides in the conflict - he's definitely not a supporter of Islamic State, but neither does he support the Shia militias, and he's deeply critical of the Iraqi government. The fake battle was essentially teasing the militias to see if they would seize upon the news to claim victory. And to that end, he says, the prank worked. "After a few hours we started to see [Shia] Facebook accounts saying ISIS has lost the battle, and this was a great victory," he says.